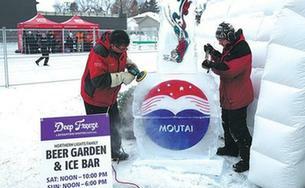 Kweichow Moutai is one of the most widely consumed hard liquors in the world. Pingtang Bridge in Southwest China's Guizhou province is set to become the world's highest concrete bridge. The US Division Final of the 2018 Artificial Intelligence Global Competition concluded in Silicon Valley, California on April 8. 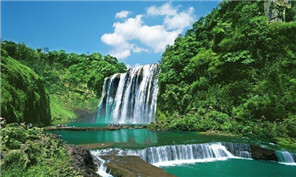 Getu River Geological Park was recently listed as a national geological park by the Ministry of Land and Resources. The Guizhou Tourism Alliance held its 2018 annual conference and passed governing regulations in Guiyang, capital of Guizhou province, on March 30. "It's delicious," said Thai princess Maha Chakri Sirindhorn in Chinese during her tour at Laoganma Company on April 6. Dong chorus teams from Guizhou's Liping county won a number of awards, including gold medals, excellence medals, and other top awards, during their recent participation in a Hong Kong art competition for middle-aged and senior citizens across the country. 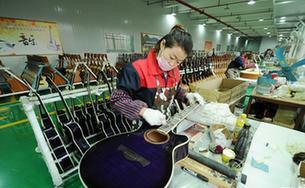 Employment at the guitar industry in Zheng'an attracts a large number of migrant workers to return home.